Help with choosing a WordPress theme is perhaps the most popular question one around. It is a legitimate question. We all want our site to look good, and true to our vision. 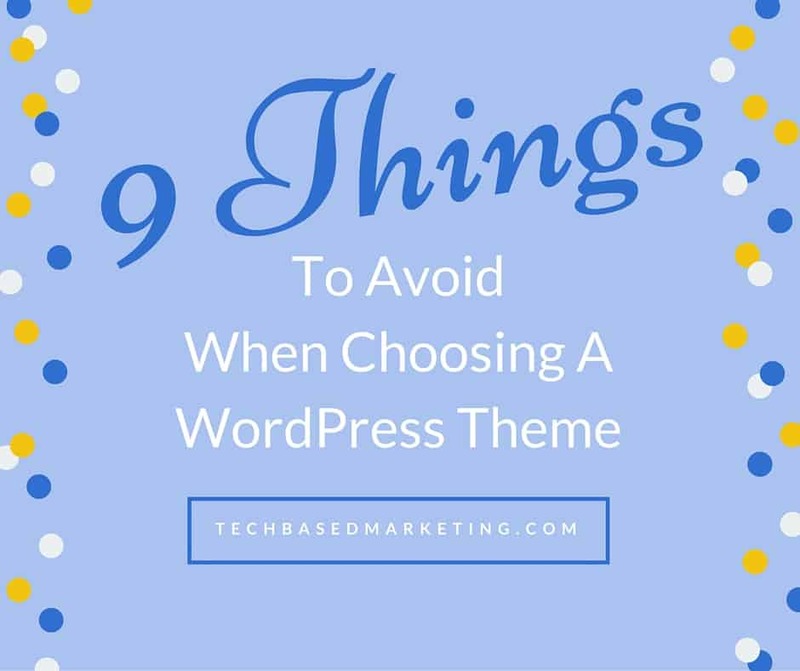 If you’re seeking a theme, here’s what you want to avoid. People spend far too much time finding the right theme. Very often, we fall into what I call theme paralysis. You can’t decide on the “perfect” theme, delaying the launch of your project. When too much time has passed, enthusiasm for the project wanes and soon, you end up with unmet goals. This the deadliest thing for any project. Pick one as close to your vision as possible. Then take that leap of faith! It will work out. Themes can be changed easily (make sure you read #3 first). In fact, I can almost guarantee, as you work your project, you will outgrow that “perfect” theme in time. This is one reason I like Studiopress / Genesis because they have a lot of designs to choose from. Right now, I have 86 themes in my account. And, because I am a Pro Plus member, I also get any new theme they or third party designers release. That’s plenty to fit just about any project I am working on. This is the twin of the above. The great thing about WordPress themes – many are very customizable. Too easily sometimes. And that creates a never-ending process of tweaking and editing of the theme. While you are busy perfecting the look of your site, content goes unpublished. Mailing lists aren’t built. Products aren’t being sold. When it comes to getting your theme just right, 100% of the time the answer to that is a big fat NO. Do not confuse this with optimization. There are times you need to tweak the landing page layout, change button colors, modify position of your offer. All to improve conversions, usability, and/or clarity. These can only happen AFTER your site is launched, running and getting some results. If you have zero results, good or bad, you don’t need to optimize yet. As a developer, I love the idea of shortcodes because it lets us create rich tools for you to use. The problem comes when designers use shortcodes to generate the most simple things like a pull quote, fancy looking button, or tables. This is a terrible use of shortcodes. Every shortcode needs to be processed. And while the processing is often quick, I’d rather not give my site more work to do than necessary. Besides, depending how it is coded, sometimes shortcode implementations can have a big impact on site performance. The more important reason to avoid shortcodes built into themes is shortcode mess. This is when you are left with a chaotic soup of content mixed with code when you switch themes. Imagine having to remove these codes from thousands of pages before you can successfully switch a theme. Shortcodes belong in a plugin. Not themes. Avoid at all costs. Studiopress has ho shortcode add-on. And, until March 31, 2016, you can get all their themes now and in the future for one price, without recurring fees. Highly recommended if you have multiple sites and projects. Unfortunately, this is not an easy thing for a non-developer to figure out. Some themes tightly integrate these plugins and don’t give you a hint that they do. While others openly tell you. The problem with this is, the plugin inside the theme is not kept up to date. Guess what happens when a security hole is found? I also personally avoid themes what openly tell me I need a certain plugin first. To me, this means adding yet another plugin when I am trying to keep things lean. While I don’t necessarily agree with the all encompassing rule where less plugins equal better performance. But, that doesn’t mean I pile them on either. Use plugins judiciously. If one is truly required, use it without worrying too much about the number of plugins. However, when the need has passed – as it can from time to time – get rid of it. There was once a very popular theme that can only work with Pages. You might still find it being used on older sites. This is not so common now, but in it’s place are some page builder themes where you lose your content if you switch themes. Who wants to re-create pages when you switch themes? Nobody. A theme should work flawlessly with built in post and Pages. You shouldn’t lose all or even parts of your content when you switch. You shouldn’t have to doctor your content when you switch themes either. Custom post type support is a nice addition, but post and Pages are an absolute must. Support from the company you are buying from is important. But, 9 out of 10 times when I need help, I go to the community first. That’s because whatever you encounter, someone else has as well and likely have a solution. Look beyond in-house support. If you are in a hurry and it’s a holiday weekend, can you get help elsewhere? This is one reason I keep coming back to Studiopress. Not only is there a big community, there are lots of designers who love Studiopress. That’s a good thing for when you decide to outsource. Things are fixing to change BIG TIME with Studiopress. Until March 31st, you can get all current Studiopress themes and future ones for one lifetime payment. Support and update included. Don’t miss out. Click to get it now or you will pay a yearly support and update fee later. Yes, there are some incredibly popular themes there. Yes, some of them look truly amazing. I’ve purchased a few themes from there. I also buy things from the various Envato marketplaces from time to time. Here are a few big reasons why I typically avoid Themeforest. Vague and restrictive licensing. Sometimes, you want to use a theme a certain way. Envato allows designers to choose only two types of licensing. You can of course ask and many developers are pretty generous, but the burden is on you to keep having to ask and to keep track what is communicated. Your time is too valuable for that. It’s tough trying to get a refund from Envato. They don’t believe in refunding if you do not like the theme. Many themes there are bloated. I like to keep my themes lean and do the heavy lifting through plugins or custom code. Of course, this is just a matter of preference. On the other hand, it is all based on years of experience. You can heed the advice or leave it. I hope you at least heed #1 – #3. Particular #3. What about Divi in Elegant Themes? This is the biggest problem with StudioPress – no drag and drop (at least for now). I was just going to ask the same thing. I’ve been redesigning my blog using Divi. I know nothing about coding, etc. and I want to make sure I haven’t gotten into something I shouldn’t by using Divi. My blog is looking good but I don’t want to have problems down the road because of stuff I couldn’t see/didn’t know to look for. Unfortunately Divi uses shortcodes heavily 🙁 If you don’t use the Builder and any of it’s editor options (boxes, buttons, tabs etc) you’d be good but that’s the problem. Because it is available and so easy to just pop something in, it’s very hard to resist. Studiopress Genesis is a framework – a base – for you to build upon. They consciously decided to keep it light and lean and not force anyone to use a page builder. I know page builders are all the rage, but I appreciate the fact I can make a minimalist design with Genesis very easily, or go full bore and add Beaver Builder or Thrive Content and go to town. I hope they never add a page builder, and if they stick to their roots, they never will. Agreed Karl. I am really enjoying Beaver Builder. Haven’t had a chance to add Thrive to my toolbox yet but I think I love Beaver too much to start over. I much rather to add Beaver only when I need a page builder because not all sites need one and really, for me the only time a page builder is needed is when you want a landing page. Which again, some sites don’t have.